I would like to visit a subject that seems to have convinced sceptics that they have a strong argument against the Loch Ness Monster. It concerns the ubiquitous mobile phone camera and the idea that their increased presence should produce more photographs of Nessie and more convincing ones at that. This article addresses both of these issues. Now it cannot be denied that access to a camera in one’s pocket has increased greatly in the last decade or so. As far as I can ascertain, the camera feature on mobile phones first appeared in 2000 with the Japanese J-Phone. Since then, you could argue that almost everyone carries a camera with them wherever they go. There is one graph I saw which sceptics referred to which shows a steep curve of mobile phone take up in the last 10 years. It is shown below with the dismissive, arrogant tone you sometimes encounter from a small number of sceptics. So the argument runs that with all these mobile phone cameras jostling around Loch Ness, there should be more pictures of the creature. The sceptics say there are not; therefore the Loch Ness Monster does not exist. But is the argument that simple? Let us take a closer look. First off, let us try and create a graph of films and photographs taken at Loch Ness over the last 80 years which purport to show Nessie. I include films and videos here because mobile phones now have video recording capability too (though that feature did not come to the fore until about 2007). Of course, the issue here is what constitutes a photograph of the Loch Ness Monster? As a colleague pointed out to me at my recent Loch Ness Monster talk, there is no such thing as a “confirmed” sighting that satisfies both believers and sceptics. So with that in mind, it is best to include all claimed images and take it from there. Looking around the literature and recent research, there are plenty of images ranging from water disturbances to the more incredible. I have filtered some out on the basis of a few assumptions. Firstly, the photos I consider fakes are left out and also the results of large scale organised searches such as the Loch Ness Investigation Bureau during the 1960s. What I am interested in is the tourist or local with his camera. The graph below is denoted in decades rather than years and film and photographs are combined into a "BOTH" count (thanks to Charles Paxton for help with the database). The right axis denotes the film/photo count. As an aside, the first thing that will strike you is the drop off in reported sightings since the 1960s and reminds us of the recent "Is Nessie Dead?" flurry of news articles. In reality, the drop will be down to a combination of the factors listed below. 1. People are less easily fooled by natural loch phenomena. 2. People are less motivated to report sightings in a sceptical age. 3. People find it harder to find an "official" centre to report sightings. 4. The media does not report as many sightings as it used to. 5. The creature(s) is surfacing less often either due to population decline. 6. The creature(s) is surfacing less often due to aversion to increased surface activity. 7. Reports from recent years have still to filter through to researchers. These can be argued about as to validity or priority, but it would seem clear that a decrease in sightings should lead to a decrease in photographic opportunities and hence images. But as you can see, the number of images captured in rising. However, the graph gets more interesting if the images captured are expressed as a percentage of total sightings for that decade. As you can see, the number of images as a proportion of sightings has been increasing even more rapidly since the 1980s and it is reasonable to deduce that a component of this is due to increasing availability of not only mobile camera phones but also earlier devices such as the camcorder. So it seems the sceptic's objection is answered, image count is up. It should also be noted that though the use of mobile phone cameras was on a steep rise, this does not necessarily apply to Loch Ness which is not a general population case. It is clear that Loch Ness has always had a higher proportion of lenses on it than your typical statistical scenario and that means the expected rise in images will be less pronounced. Another factor which eats into the supposed steep curve expectation is group dynamics. As I looked over these cases, it became apparent that in group situations, there only seemed to be one image produced. What appeared to be happening was that in cases where a group is witnessing an event on the loch, one person undertakes the recording whilst the others just keep watching. I would suggest that even if there are 5 or 6 mobile phones in pockets or bags, there is a "deferring" to the person with the best recording equipment (e.g. a camcorder). Also, since a better view is obtained with the naked eye rather than looking through a viewfinder, people would rather make the most of the situation by just watching and let the other guy do the image capture. That won't be a hard and fast rule, but I am not aware of cases of multiple, independent images per individual case. Again, we have a Loch Ness specific situation here which dampens the curve. I hope that answers the first case of alleged inadequate image counts. One point that came to mind when thinking through this issue was camera quality. The quantity of cameras has increased, but what about the quality of cameras? To get a handle on this, I took a series of comparison pictures with a mobile phone camera and an ordinary digital camera. Note that both the iPhone and the Canon are not top of the range for their class and so can be regarded as a good approximation to the "average camera" at Loch Ness. Here are some of the comparison images with the iPhone displayed first. The next four pictures were taken at Lochend where boat traffic is more dense. You can see the advantage that the ordinary digital camera has in terms of light capture due to its larger aperture. The problem is further exacerbated when further detail is sought by zooming into the object of interest. As you can see, the Canon digital camera wins hands down over the iPhone. The iPhone can only do digital zoom which does not add more information to the image. The Canon's optical zoom will always win out here. There may be more cameras focused on Loch Ness, but what do they bring to the table in terms of quality? As regards videos, it is often a complaint why witnesses do not switch to video mode in order to produce a more convincing set of images. But how true is this? I photographed a rainbow over Urquhart Bay last August and I also switched to video mode to record that too. Though this was taken with the digital camera and not the iPhone, the difference in quality is there for all to see (below). Indeed, unless the video recording device is mounted on a tripod, I am not sure that running in video mode is a better option. The camera shake can render the footage useless and even if one has a stable hand that can overcome the excitement of seeing the monster, the witness may attempt to zoom in on the object and increase the shake to intolerable levels. Needless to say, tripods are not mandatory items in the tourist's suitcase. The second argument is that all these mobile phone cameras should not only produce more images but also that definitive, close up image. As just stated, the quality of such devices is inferior to the produce of more traditional cameras. But the general rgument is statistical, the greater the distribution of cameras, the higher the probability of a close encounter picture. However, there are mitigating factors that make no difference to how many cameras are present. For example, on many stretches of the loch, the road is quite far from the loch or obscured by trees. In other words, the creature may appear, but the witness is several hundred yards from it. Clearly, nothing conclusive is going to be pictured in that situation, no matter how many mobile phones are around. In the case of foliage obscuration, you are not going to spot something so easily, and so the camera stays in the pocket or bag. So the situation demands the witness to be around 100-200 metres from the creature. Perhaps on a road close to the shore (for example, the Dores to Foyers road) or perhaps as a passenger in a boat. After that, it is a matter of waiting for the monster to appear at the right distance over the 24 square miles of the loch surface. But as we have just noted, sightings are down while camera presence is up. To put it another way, if sightings are down to a quarter of what they were 15 years ago but camera presence has also quadrupled, then they cancel each other out! There is no expectation of more quality pictures. But the image count is up, so there is yet hope for that elusive, quality image. In fact, good images of the monster are extremely rare. Over the last eighty years, I would count only at most ten as good images in still or movie format. That is one every eight years and based on what I have said about factors cancelling each other, I have no reason to believe that will improve despite the protestation about numerous low grade cameras "flooding" the loch. But, again, is not the image count up per decennial sightings? Yes it is, but the quality images that rank with MacNab or others still occupy a low percentage of the total image count (about 15%). So, I am optimistic that better pictures than the recent Rowe or Bright ones will come out before the end of this decade. The caveat is always the same though. A good image will turn up but the sceptics will dismiss it right away. Damned if you, damned if you don't. That is why I don't take these sceptical arguments too seriously as there is a hint of duplicity in them. Related to this question is that oft mentioned derogative "grainy, old, black and white photographs" when referring to pictures of the Loch Ness Monster from decades past. If you think this is an invitation to regard modern photography as vastly superior in terms of image capture, then decline the invitation! The "grainy" adjective has nothing to do with the quality of the original negative and, in fact, refers to the all too common method of blowing up the print of a monster picture to the point of graininess. The modern equivalent would be enlarging a digital image until individual pixels are resolved. The "old" is irrelevant so long as the the image is preserved for future use. Unfortunately, negatives get lost copying degrades the image. However, this is an argument equally applicable to digitial images. Original image files are lost or replaced by inferior JPEG images. Is a colour image superior to a black and white image? Clearly it is as it contains more information. However, how important is the difference in capturing that conclusive picture of the Loch Ness Monster? A colour image would be more desirable to researchers such as myself as it adds information on the skin colour and shades. But is it any use to sceptical viewers? I suggest that if a black and white picture of a claimed monster does not convince a sceptic, then neither would the colour equivalent. Finally, were the old analog 35mm cameras, 16mm cameras or Hi8 camcorders inferior to the digital equivalents of today? In terms of the silver based films, you will this old medium was as good as if not better than what has been on offer digitally over the last decade or so. The debate over the megapixel equivalent of 35mm film continues but though its theoretical limit has been suggested as 50 megapixels, a working number somewhere near 20 megapixels has been touted with cameras such as the 21MP CanonSLR EOS 5D Mark II being suggested as being as good as the old 35mm SLRs. You can buy the new Mark III for a mere £2,000+ on Amazon. Likewise, the 16mm films were as good as many of the the Hi-def camcorders out there based on the same arguments. There is no argument when comparing old films to lower spec mobile phones and digital cameras in video mode. 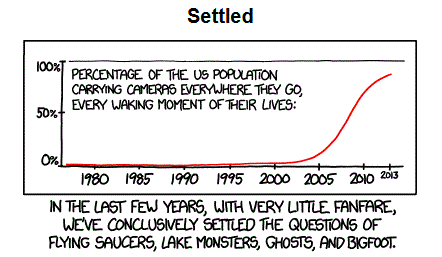 So, the argument really boils down to how many cameras and cine cameras people were taking to Loch Ness up to the 2000s compared with the new digital years. I am not sure anyone can speak authoritatively on that question. In regards to capturing video footage, InfoTrends conducted a survey in 2012 asking European comsumer what their preferred means of video capture was. The chart below is most informative. Nearly a quarter said they don't do any video recording, less that a fifth used the superior camcorder and the remaining 55% were split between the inferior video modes on cameras and mobile phones. It seems the prospects for getting that 1080p camcorder footage of Nessie has diminished somewhat. On the subject of close up pictures, I had that "Greta Finlay" moment when taking a lunchtime walk on the Fife coast some months back. I glanced into a farmer's field and noted a deer was walking neck high amongst the crops. This was an opportune time to do a test I thought to myself. I whipped out the iPhone and snapped the picture you see below. After the animal had taken off, I measured out just over thirty paces to the spot it had occupied when photographed. That worked out at about 25 yards compared to Greta Finlay's 20 yards. So you may have wondered how good a picture she would have got if she had a mobile phone camera on her person? Wonder no more, the answer is not that good an image. However, the zoomed image below is certainly sufficient to identify it as a deer. If it had been something more mysterious, I am not sure we would have got very far in making further identification. So, the argument that good, close up pictures should be more prevalent with all those mobile phones around looks even more rough round the edges. I didn't think to record a video with the iPhone at the time, but I returned recently to record the same area to compare the quality. Click on the image below to see that. Again, I am not sure what is to be gained by switching to this lower resolution image unless a stable platform can be achieved with a good optical zoom. Sceptics supply arguments aimed at destabilising believers, but it is not always the case that they proof read their own theories before they are hurled in this direction. This happens to be one of those cases where a generalisation is framed upon a specific situation (i.e. Loch Ness). Photographing the Loch Ness Monster is an extremely hard task. The lack of good images speaks of a creature that has no need to break the surface unless it really has to. The wide expanse of the loch plus the starting distance between the witness on the road and the shoreline adds to the difficulty. What is needed is a creature surfacing less than 100 yards from the witness with his good quality camera. As it turns out, that combination of events is the exception rather than the rule.